You know spring is in the air when there are fresh green vegetables flooding back into the markets. And while things might be warming up, the nights are still chilly. That's when this delicious, tummy-warming spring minestrone soup comes in handy. 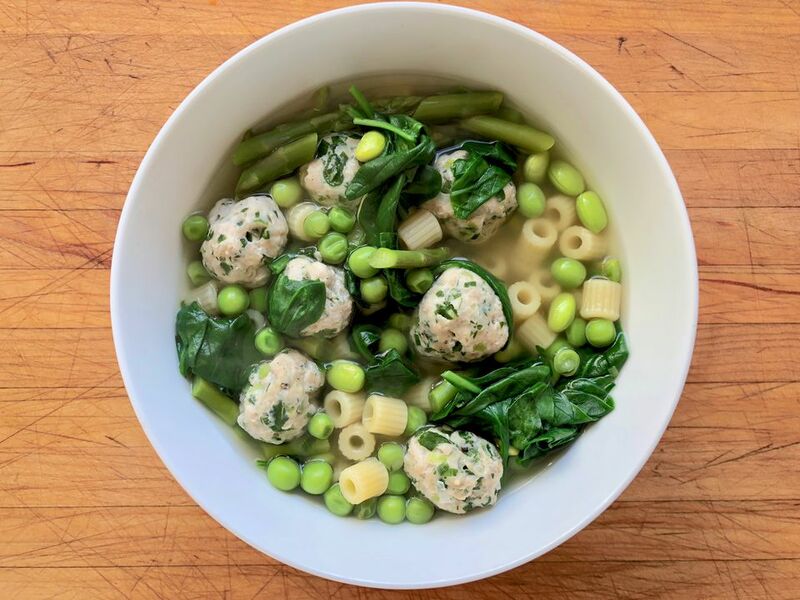 Between the fresh and bright flavors of the lemongrass, asparagus, and edamame, and the hearty chicken meatballs, this springtime soup is a wonderful, filling, complete meal that will warm your soul. Put the ground chicken in a bowl. Trim and mince the green onions—white, light green, and dark green parts—and add them to the chicken. Pull the parsley leaves off the stems. Mince the leaves and add them to the chicken. Add 1/2 teaspoon salt to the chicken. Mix the chicken with everything else into an even mixture. With damp hands, form and roll tiny meatballs—about 2 teaspoons each. Put the meatballs on a plate, cover, and chill for at least 30 minutes and up to overnight. Bring a pot of water to a boil. Add enough salt to make it taste as salty as the sea. Add the meatballs and simmer until cooked through, 3 to 5 minutes. Lift out with a slotted spoon and set on a plate. Bring the water back to a boil and cook the pasta until tender to the bite. Drain and set aside. Bring the chicken broth to a simmer. If using the lemongrass, trim the stalk and cut into 4 or 5 large pieces. Add them to the broth as it comes to a simmer. Meanwhile, trim the asparagus (you can peel it, but snapping it is much faster and perfectly fine for this application) and cut it into 1-inch pieces. Add the asparagus to the simmering chicken broth, along with the peas and edamame. Cook until the vegetables are tender, 3 to 5 minutes. Add the chicken meatballs, pasta, and baby spinach leaves. Cook until the spinach is wilted and the meatballs and pasta are heated through, about 3 minutes. Serve hot. Top with Parmesan: Grate some fresh Parmesan on each serving so the cheese melts into the soup when it hits the table. Float crunchy croutons on top: Cut or tear a baguette or country loaf into bite-size pieces. Toss them with a bit of olive oil, toast in a hot oven, and add to the soup as you serve it. Add browned garlic: Peel and thinly slice a clove or two of garlic, heat 1 tablespoon of olive oil in a small frying pan, add the garlic and cook, stirring constantly, until the garlic slices are browned, 1 to 2 minutes. Add to the soup just before serving. Brighten with lemon: Add a sprint of fresh lemon juice just before serving for a brighter, even springier flavor. Try different greens: Use arugula, escarole, or other savory greens in place of the spinach. Add more cooking time as needed to make sure they're tender when you serve the soup. Drizzle in some oil: Toasted sesame oil is a natural pairing for these ingredients—drizzle 1/2 teaspoon onto each serving as it's ready to eat.